"The windows and sliding door looks great. They are heavy grade and built tough. The Install team did the best job that I ever experienced. The caulking job both inside and outside was remarkable. Shows some real talent. I did not need to touch a thing related to the windows. We can finish painting the trim and we are done." You may not remember me, but you and your crew installed 20 Okna windows about a year and a half ago in our house. Everything fit and worked great, but our first winter was hard to judge the energy savings since we had just converted from propane to natural gas. The first summer saw higher than normal temperatures, but our electric bill was considerably lower than previous years. The highest monthly gas bill we saw from Sept 2013 to November 2013 was $36. This morning I woke up to a 3* F outside temperature. The few windows that had not been replaced with the STARMARKS (3 bathroom thermo pane and 3 door windows) had ~1-2 inches of ice at the bottom. Looking at the Okna windows, I found no ice and not even condensation! As an engineer, I’m very impressed. I can’t wait to see our December and January gas bills to see the savings. I just wanted to drop you a line while I was thinking about it and say thank you for your product and services. I’ve dropped your name to many friends and will absolutely sing your praises for the service and products after this winter. Well I have written a rather long review of the job that Windows on Washington did for me. It is rare indeed to run into a Washington, D.C. area Company that deals with Roofing, Windows, Siding , Gutters and all that goes along with that and have them turn out to be just an outstanding business, not only in the work that they do, but in the people they are. Eric, Tara and Dawn all seem to be cut from the same cloth, so to speak in that they are all friendly, helpful and will bend over backwards to help the customer with their project. My project entailed a great deal of work and it expanded in what was done and the time it took as we progressed. Though all of this Eric was here and kept me up to date with everything going on. The Project turned out to be completed within the budget and that is a very very rare thing these days. Eric and his crew of many are to be commended!!!! I am posting a photo of the rear of my house with the Roof completed and the Windows Completed. The Siding isn't visable here as it is on the ends above the brick and also in front, too. 1st Project: "Windows on Washington has been great. Unlike many vendors in the Washington Area, they show up on time, are flexible, and don't push products I don't want or need. They are also one of few Windows vendors that I have found that are willing to deliver a few windows when I want them, rather than insisting I do my whole house. So far, they installed several windows as part of my Kitchen remodel, and air-sealed and insulated my attic and basement. Both jobs were done on time and within budget. Highly Recommended Vendors!" 2nd project: "The installation was very smooth, and certainly up to the standards I have come to expect from Windows On Washington! ... The installation team was quick, efficient and cleaned up after themselves. I'm impressed with the appearance and the installation details, and look forward to my annual energy bills dropping through the floor (relatively) compared to the old windows and doors." "Thanks to the entire Windows on Washington team for their excellent work." "I just wanted say "thank you" for the great job you all did on our window installation. The new windows are simply gorgeous and make our home look so beautiful! From the beginning of this process, with Greg's excellent presentation and thorough conveyance to me of window knowledge at our initial meeting, with Eric's "take charge" attention to detail and dedicated customer service in making sure measurements were accurate and done in a timely manner, to Julia's constant open, professional, warm and informative communication (especially on the day of installation), to everyone in the WoW offices for helpful phone calls during this process, and culminating with Young's calm, steady, soft-spoken, respectful, intensive leadership on the job (with his awesome hard-working and friendly crew), your company transformed our home and relieved all my anxiety over having such a major renovation completed; all done for a price that was reasonable and affordable! I commend your company for a job well done and will happily display your sign in my yard and will recommend your company to all that I know in need of new windows and doors. I will definitely call your company first for my future projects needs!" "Replacement of 26 windows in the winter was initially a concern but WOW's highly trained installation crew worked with us every step of the way so that my wife's elderly parents would remain comfortable." "WOW researched the replacement of two wood-rotted oval windows that two other companies had said they could not/would not replace. Consulting with us every step of the way, WOW suggested, devised and implemented a solution that looks and works great. The job went amazingly fast. We are extremely pleased with the Okna windows and their expert installation. WOW has also been extremely helpful in providing all the information needed for a rebate from Columbia Gas." "All employees that we encountered from this company were friendly, professional, punctual and highly skilled. This company is top notch from top to bottom and excels at customer service. You will be very pleased and well taken care of if you choose this excellent company!" 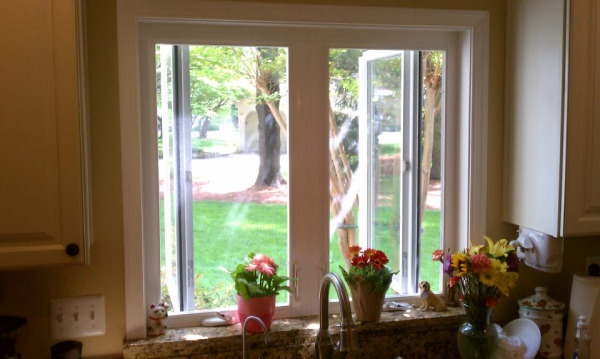 Here is a photo of the Okna 700 casement window installed by WoW for my kitchen renovation. This is a beautiful window that is one of the highlights of the new kitchen. I had the countertop guys fabricate a granite windowsill, which fit perfectly under the hand cranks and really looks great. The casement window is beautiful and well-built, a bit more costly but worth it. Zach and the WoW team did a terrific job as usual, explaining the options and doing a quality job on the installation. This was a small job for them (compared to the 22 windows I had them install a couple years ago) but I got all the personal attention I needed, along with a fair price and on-time delivery. Thanks! Everything, start to finish was great. From our initial talk with Brandon to the work done by Young and his crew, it was really very pleasant. We've only had the windows for a few days, but already we notice that there is no drafts and it seems more quiet. All in all, a great experience working with you and Windows on Washington. "I was very pleased with my contact with and work performed by Windows on Washington. From sales to scheduling to accounting, all of the individuals I spoke with were knowledgeable and responsive. The actual installation team was punctual, efficient, and polite. They did a great job removing my terrible old windows and then installing the new ones with minimal disruption. I love the way the new windows look from both the interior and exterior, and I can already tell that they're about a zillion times more energy-efficient than my old ones. I wouldn't hesitate to recommend WoW to family and friends, and I'm already thinking about having them replace my front door or do an energy audit." 'I know we had a few back-and-forth communication issues throughout our project, mainly because my wife and I changed our minds about what kind of window we wanted after we signed the contract, which made ordering take longer and made installation more complicated. But, I think it is clear that your company has very good systems and people in place to take customers through every step of the purchasing and installation process. A case in point is the fact that we got several confirmation emails and/or phone calls when you received our deposit and final payment, and when we scheduled the installation. We were concurrently dealing with other home improvement companies that could learn A LOT from the way you make a point to stay in contact with your customers. If you look on a site like Angie's List, I think you will see that just about the number one issue from the customer's perspective is some form of "the contractor never called me back." WoW was very good with not only calling me back, but being proactive and letting me know where in the process we were. Believe me, it is VERY MUCH appreciated!" "I did a final walk through today and everything looks great. We are very happy with our new windows. Young and the other gentleman took their shoes off in our home, laid down drop clothes, and cleaned up after themselves. We appreciate their care when in our home. Additionally their install was great. The use of slow expanding foam on the outside of the window was great to see. Back in 2010 when we had Okna 500s installed at our other property it wasn't done. So again, I'm very happy with that. Lastly, thanks for your great communication and the quick turn around on scheduling was much appreciated. We have several more windows we need replaced and we are hoping to have them done by mid-year. We will definitely be in touch when we are ready to move on those." "It was a superb experience. They were really something. They were prompt, professional, and efficient. The communication was excellent, both by telephone and email. They were very responsive with any of our questions. The employee who performed the estimate was efficient and cordial. They provided a thorough detailed document explaining of every aspect of the service, titled "Installation guidelines and check list". This document is provided to make you aware of the service throughout the entire process which makes a big difference. They really focus on satisfying the customer. They gave us what seems to be a great product. It looks very nice. They also explained what to do with rotting areas. The crew was incredible. They performed the work in half a day. They came when they said they would and completed the job. They made sure to lay a tarp throughout our home to protect our flooring. It was a tricky project and they made sure to match the new windows with the existing ones. 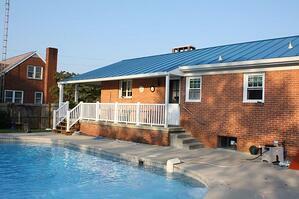 The price was almost half compared to another estimate received." My installation was not the average window replacement. WoW explained exactly how the plan to install this difficult installation. No other company explained the installation to my satisfaction. WoW did and got the job. Windows on Washington has earned the service industry’s coveted Angie’s List Super Service Award, reflecting an exemplary year of service provided to members of the local services marketplace and consumer review site in 2018. *Please note: at this time we only provide services in Maryland and Virginia.